The free agent signings in the NBA picked up following the announcement from LeBron James that he would be returning to the Cleveland Cavaliers. Isaiah Thomas, Chris Bosh, and Anthony Morrow are among the players taken off the board. Check out the top free agents left at every position below. Isaiah Thomas — Played with Sacramento Kings last year, restricted free agent. Pursued by teams including Los Angeles Lakers and Phoenix Suns. Re-signed with Kings then was traded to the Suns. Eric Bledsoe — Played with Phoenix Suns last year, restricted free agent. Jameer Nelson — Played with Orlando Magic last year, unrestricted free agent. Kirk Hinrick — Played with Chicago Bulls last year, unrestricted free agent. Re-signed with Bulls, source told NBA.com. Mario Chalmers — Played with Miami Heat last year, unrestricted free agent. Re-signed with Heat, sources told ESPN. Ramon Sessions — Played with Milwaukee Bucks last year, unrestricted free agent. Mo Williams — Played with Portland Trailblazers last year, unrestricted free agent. Pursued by teams including Dallas Mavericks. D.J. Augustin — Played with Chicago Bulls last year, unrestricted free agent. Pursued by teams including Orlando Magic and Charlotte Hornets. Signed with the Detroit Pistons, reported NBA.com. Dwayne Wade — Played with Miami Heat last year, unrestricted free agent. Expected to re-sign with Heat. 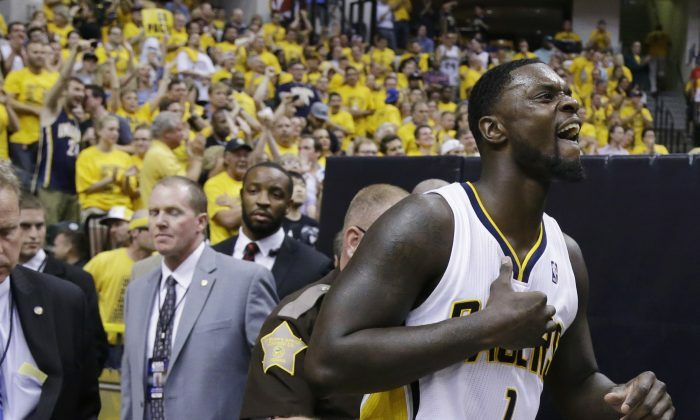 Lance Stephenson — Played with Indiana Pacers last year, unrestricted free agent. Pursued by teams including Dallas Mavericks. Jordan Crawford — Played with Golden State Warriors last year, unrestricted free agent. Pursued by teams including Chicago Bulls and New York Knicks. Ray Allen — Played with Miami Heat last year, unrestricted free agent. Pursued by teams including Cleveland Cavaliers. Alan Anderson — Played with Brooklyn Nets last year, unrestricted free agent. Re-signed with Nets, reported USA Today. Nick Young — Played with Los Angeles Lakers last year, unrestricted free agent. Staying with the Lakers, per AP. Rodney Stuckey — Played with Detroit Pistons last year, unrestricted free agent. Jimmer Fredette — Played with Chicago Bulls last year, unrestricted free agent. Carmelo Anthony — Played with New York Knicks last year, unrestricted free agent. Pursued by teams including Knicks and Chicago Bulls. Officially announces that he’s returning to the Knicks. Trevor Ariza — Played with Washington Wizards last year, unrestricted free agent. Pursued by teams including Los Angeles Lakers and the Wizards. Agreed to deal with Houston Rockets, sources told Yahoo. Later reported that the deal was a sign-and-trade. Luol Deng — Played with Chicago Bulls, Cleveland Cavaliers last year, unrestricted free agent. Pursued by teams including Atlanta Hawks and Dallas Mavericks. Has reportedly agreed to deal with Miami Heat. Chandler Parsons — Played with Houston Rockets last year, restricted free agent. Pursued by teams including Dallas Mavericks. Mavericks signed to offer sheet; Rockets won’t match, Parsons announced. Paul Pierce — Played with Brooklyn last year, unrestricted free agent. Pursued by teams including Los Angeles Clippers and the Nets. Agreed to deal with the Washington Wizards. Anthony Morrow — Played with New Orleans Pelicans last year, unrestricted free agent. Pursued by teams including Washington Wizards and Los Angeles Clippers. Signed with Oklahoma City Thunder. Mike Miller — Played with Memphis Grizzlies last year, unrestricted free agent. Pursued by teams including Cleveland Cavaliers and the Grizzlies. Richard Jefferson — Played with Utah Jazz last year, unrestricted free agent. Signed with Dallas Mavericks, sources told ESPN and Yahoo. Gordon Hayward — Played with the Utah Jazz last year, restricted free agent. Jazz matched offer sheet from Charlotte Hornets. Evan Turner — Played with Indiana Pacers, Philadelphia 76ers last year, unrestricted free agent. Shawn Marion — Played with Dallas Mavericks last year, unrestricted free agent. Caron Butler — Played with Oklahoma City Thunder last year, unrestricted free agent. Close to deal with Pistons, reported ESPN. Chris Bosh — Played with Miami Heat last year, unrestricted free agent. Pursued by teams including Houston Rockets. Re-signed with Heat. Andray Blatche — Played with Brooklyn Nets last year, unrestricted free agent. Pursued by teams including Toronto Raptors and the Nets. Udonis Haslem — Played with Miami Heat last year, unrestricted free agent. DeJuan Blair — Played with Dallas Mavericks last year, unrestricted free agent. Being pursued by Washington Wizards. Kris Humphries — Played with Boston Celtics last year, unrestricted free agent. Pau Gasol — Played with Los Angles Lakers last year, unrestricted free agent. Pursued by teams including New York Knicks and the Lakers. Has announced that he signed with the Chicago Bulls. Greg Monroe — Played with Detroit Pistons last year, restricted free agent. Chris Andersen — Played with Miami Heat last year, unrestricted free agent. Being pursued by multiple teams including the Heat. Jermaine O’Neal — Played with Golden State Warriors last year, unrestricted free agent. Might retire. Andrew Bynum — Played with Indiana Pacers last year, unrestricted free agent.